This page is your whole food plant-based diet resource guide for helping with the transition including links to doctors, cookbooks, documentaries, a few products, and other services. As your guide to health and well-being, I hope you'll find these useful. If you're new to eating a plant-based diet, you can feel confident that these are some of the best. Disclaimer: Some of these resources have affiliate links. I only recommend items that I use and/or trust and will receive, at no extra cost to you, a small commission if you purchase to help keep the website going. Thanks for your support. Dr. Neal Barnard, MD has led numerous research studies investigating the effects of diet on diabetes, body weight, and chronic pain and has authored more than 70 scientific publications as well as 18 books, including the New York Times best-sellers Power Foods for the Brain, 21-Day Weight Loss Kickstart, and the USA Today best-seller Dr. Barnard’s Program for Reversing Diabetes. He is also the president of The Physician's Committee for Responsible Medicine. Dr. Cadwell Esselstyn, MD is the author of Prevent and Reverse Heart Disease and is featured in the documentary, Forks Over Knives, ha been championing eating a plant-based diet for decades and continues to be a leader in the movement. Dr. T. Colin Campbell, MD, is the author of The China Study, has been dedicated to the science of human health for more than 60 years. His primary focus is on the association between diet and disease, particularly cancer. Dr. Linda Carney, MD has been practicing medicine since 1986. Her website offers helpful resources, articles, coaching and a community for people who want to transition to eating a plant-based diet. Dr. Jami Delaney, MD is a general practitioner and is a leading provider of cardiac care in Port Charlotte, Florida who also has a plant-based wellness podcast, nutrition courses, and private coaching. Dr. Garth Davis, MD. is the medical director of the Davis Clinic at the Methodist Hospital in Houston, Texas, and starred on the hit TLC show, Big Medicine. He is the author of Proteinaholic: How Our Obsession With Meat Is Killing Us and What We Can Do About It, and a huge proponent of a plant-based diet. Dr. Joel Fuhrman, MD is a leader in the plant-based diet movement and has authored six New York Timebestsellersrs. His approach is to advocate a "nutritarian" diet, one with the highest nutritional density. Dr. Maurice Gonzalez. Physician, internal medicine resident and plant-based diet leader for the Spanish-speaking community with a huge Instagram following. He gives you straightforward information about what the medical industry is discovering about diet and nutrition. Dr. Michael Greger, MD is a physician, New York Times bestselling author and internationally recognized professional speaker on a number of important public health issues. His latest books, How Not to Die and the How Not to Die Cookbook, are best sellers. His revealing short videos on the science of nutrition can be found at NutritionFacts.org. Dr. Joel Kahn, MD, cardiologist, believes that plant-based nutrition is the most powerful source of preventative medicine on the planet. He's a passionate advocate and has written several books. His website offers inspiration, videos and a program for reversing heart disease. Dr. Doug Lisle, PhD. has been the clinical psychologist at the TrueNorth Health Center for over 30 years. He has published numerous articles in the scientific literature. He is the co-author of The Pleasure Trap and is in private practice, conducting psychotherapy at the TrueNorth Health Center. You can see his TED talk about The Pleasure Trap here. Dr. John McDougall, MD. A physician and nutrition expert who teaches better health through vegetarian cuisine. Author of The Starch Solution and founder and director of the nationally renowned McDougall Program: a ten-day residential program. Dr. Dean Ornish, MD. For over 35 years, Dr. Dean Ornish’s series of scientific research studies have been empowering the way millions of people think about the simple lifestyle choices they make each day in dynamic relation to their health & wellbeing. Dr. Robert Osfeld, MD, MSc cardiologist, is the founder and director of the Cardiac Wellness Program at Montefiore Medical Center in New York City, where he encourages patients to embrace a whole-foods, plant-based diet. Nutrition Facts Run by Dr. Michael Greger, this site covers what the latest science says about nutrition and your favorite foods to help you make the healthiest choices for you and your family. There are more than 2,000 free videos on health and nutrition topics. Dr. Esslysten's Prevent & Reverse Heart Disease website offers links to his books, articles, successes, and more on how diet can affect health. Dr. John McDougall's Health & Medical Center. Offers 3-day intensive and 10-day live-ins for reversing and preventing disease through a plant-based, starch centric diet. Ornish Lifestyle Medicine. Dr. Ornish’s Program for Reversing Heart Disease is the first program scientifically proven to “undo” (reverse) heart disease by optimizing four important areas of your life. This program has been proven to undo heart disease by dealing with the root causes and not just its effects. The combined effect of all four lifestyle elements makes the transformative difference. PCRM (Physicians Committee for Responsible Medicine) is a non-profit research and advocacy organization based in Washington, D.C., which promotes a vegan diet, preventive medicine, and alternatives to animal research. 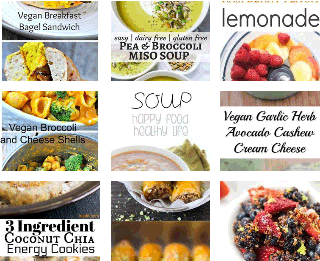 Plantricious.com has guidelines that are endorsed by the nation’s leading medical experts that make it easy for you to identify disease-fighting, nutrient dense, fiber-filled prepared and packaged plant-based foods and recipes you can trust. 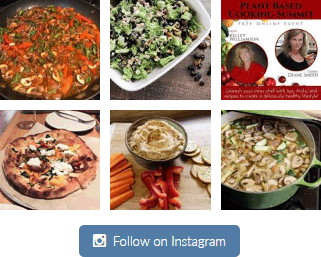 Look for the Plantricious seals on some of my recipes. How Not to Die by Dr. Michael Greger. In addition to showing what to eat to help treat the top fifteen causes of death, How Not to Die includes Dr. Greger's Daily Dozen -a checklist of the twelve foods we should consume every day. It's full of practical, actionable advice and surprising, cutting-edge nutritional science, these doctor's orders are just what we need to live longer, healthier lives. The Starch Solution by Dr. John McDougall and his kitchen-savvy wife, Mary, prove that a starch-rich diet can actually help you lose weight, prevent a variety of ills, and even cure common diseases. By fueling your body primarily with carbohydrates rather than proteins and fats, you will feel satisfied, boost energy, and look and feel your best. The China Study by Drs. T. Colin Campbell and Thomas Campbell. The China Study details the connection between nutrition and heart disease, diabetes, and cancer. The report also examines the source of nutritional confusion produced by powerful lobbies, government entities, and opportunistic scientists. The Forks Over Knives Plan by Drs. Alona Pulde and Matthew Lederman. This book shows you how to put a life-saving (and delicious) plant-based diet into practice in your own life with am easy-to-follow, meal-by-meal makeover. The Vegiterranean Diet by Julieanna Hever. Julieanna Hever takes the Mediterranean diet to a whole new level! By focusing on whole-plant foods that promote long-term wellness and ideal weight management, you can reap the benefits of the most researched and beloved diet—made even healthier. The Alzheimer’s Solution by Dr. Ayesha Sherazi and Dr. Dean Sherazi. Based on the largest clinical and observational study to date, neurologists and codirectors of the Brain Health and Alzheimer’s Prevention Program at Loma Linda University Medical Center, offer the first comprehensive program for preventing Alzheimer’s disease and its links to diet and lifestyle choices. The Mindful Vegan by Lani Muelrath teaches you how to practice mindfulness and shows how it can bring freedom and a new joy to your eating and living experience with step-by-step instructions, personal stories, positivity, humor, and a handful of delicious recipes. The Pleasure Trap by Dr. Doug Lisle. This book offers unique insights into the factors that make us susceptible to dietary and lifestyle excesses and present ways to restore the biological processes designed by nature to keep us running at maximum efficiency and vitality. Proteinaholic by Dr. Garth Davis. An acclaimed surgeon specializing in weight loss delivers a paradigm-shifting examination of the diet and health industry’s focus on protein, explaining why it is detrimental to our health and can prevent us from losing weight. Whole by Dr. T Colin Campbell. An eye-opening, paradigm-changing journey through cutting-edge thinking on nutrition, a scientific tour de force with powerful implications for our health and for our world. The Whole Foods Diet: The Lifesaving Plan for Health and Longevity by John Mackey. This book simplifies the huge body of science, research, and advice that is available today and reveals the undeniable consensus: a whole foods, plant-based diet is the optimum diet for health and longevity. The Cheese Trap by Dr. Neal Barnard. This book reveals the shocking truth about cheese-the dangerous addiction that is harming your health-and presents a radical program to lose weight and feel great. NEW Forks Over Knives: Flavor! : Delicious, Whole-Food, Plant-Based Recipes to Cook Every Day by Darshana Thacker and Carolynn Carreno. Forks Over Knives. Download, buy or watch on Netflix. This feature film examines the profound claim that most, if not all, of the degenerative diseases that afflict us can be controlled, or even reversed, by rejecting animal-based and processed foods. What the Health. $9.00 to purchase or watch on Netflix. This film follows Kip Andersen as he uncovers the secret to preventing and even reversing chronic diseases – and investigates why the nation’s leading health organizations don’t want us to know about it. PlantPure Nation. Watch the film for free. The film presents a compelling case and offers a simple solution to pervasive health conditions such as heart disease, diabetes, and obesity and tells the story of three people on a quest to spread the message of one of the most important health breakthroughs of all time. The Game Changers. Released December 2018. This film tells the story of James Wilks, elite special forces trainer and winner of The Ultimate Fighter, as he travels the world on a quest for the truth behind the world's most dangerous myth: that meat is necessary for protein, strength and optimal health. Eating You Alive. $9.99 digital download. A Feature-length documentary revealing the truth behind why Americans are so sick and what we can do about it. Food Choices. Rent for $3.99 or watch on Netflix. This film explores the impact that food choices have on people’s health, the health of our planet and on the lives of other living species. And also discusses several misconceptions about food and diet, offering a unique new perspective on these issues. A list of ten athletes who are using plants to make incredible gains athletically. A list of 23 athletes who are vegan. Check out this article, "10 TED Talks on Eating a Plant-Based" for great TED talks to inspire and motivate you to start and stick with a plant-based diet. The Rich Roll Podcast. Each week Rich delves deep into all things wellness with some of the brightest and most forward-thinking, paradigm-busting minds in health, fitness, nutrition, art, entertainment, entrepreneurship & spirituality. No Meat Athlete Radio. Vegan and vegetarian nutrition, running and training tips, and healthy lifestyle and habit change with well-known guests like Rich Roll, Brendan Brazier, Heather Crosby, Leo Babauta, Rip Esselstyn and more. Nutrition Facts Podcast. From Dr. Michael Greger of nutritionfacts.org discusses evidence-based science and natural ways to lower your high blood pressure, guard against Alzheimer's, lose weight, and add years to our life and life to our years. Food for Thought Podcast. Colleen Patrick Ggoudreau addresses all aspects of living healthfully and compassionately. Plant Yourself Podcast features interviews with guests who are healing the world with plant-based nutrition, joyful movement, evidence-based health care, gardening, environmental action, social justice, and spiritual common sense. Plant-Based Hero Podcast discusses all the pros of switching to a plant-based lifestyle including helping our body, the planet, and the animals. There are in-depth depth tips, tricks, and tactics for transitioning to a plant-based lifestyle while discussing vegan news, events, and powerful messages. Plant-Based Wellness Podcast with Jami Dulaney MD. A plant-based cardiologist and endurance athlete passionate about promoting health and wellness for all ages, Dr. Dulaney's focus is to use plant-based nutrition to prevent and reverse heart disease and diabetes. The Plant Trainers Podcast. The Plant Trainers interview top experts in nutrition & fitness such as Rich Roll, Dr. Esselstyn, Julieanna Hever, Michael Greger M.D., Dr. Garth Davis, Chef A.J., Dr. Tom Campbell, Robert Cheeke and more. They share tricks and tips about health, wellness, and exercise that busy people and families can easily implement into their daily routine. Live Planted Podcast. A weekly podcast about living a practical vegan lifestyle. The show goes into health, wellness, activism, environmentalism, cruelty-free practices, sustainability, animal rights, and how to make it all work while living a 'regular' life. This is a list of items that I find very useful in my kitchen, especially if you're new to eating a plant-based diet. Some are kitchen items and some pantry items.